So as promised here is the next installment in my Astral Claw army, no more coasting by on Squad Numas for me. 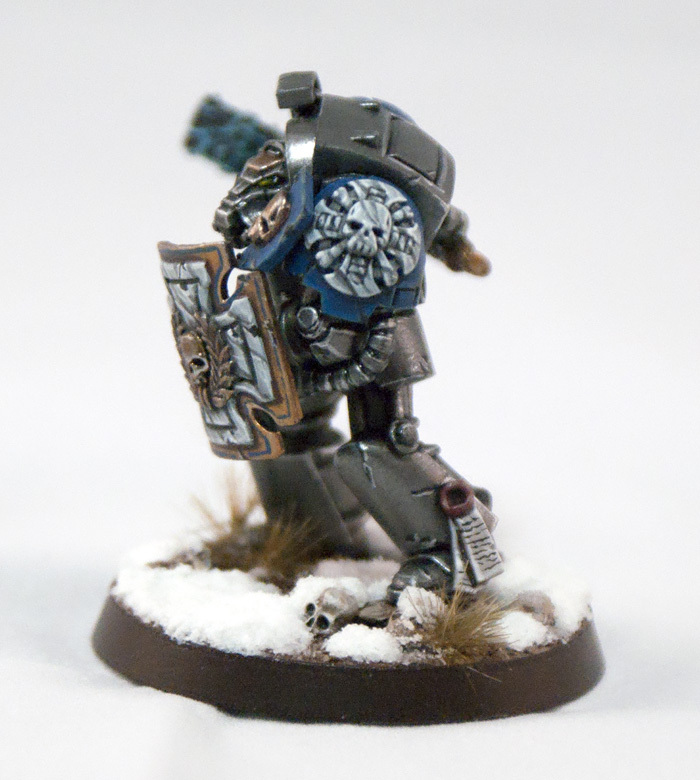 Marduk is a veteran of numerous campaigns, more than half of them as a member of the 1st company. He quickly proved his worth after being inducted into the ranks of the chapter from Badab Primaris itself. 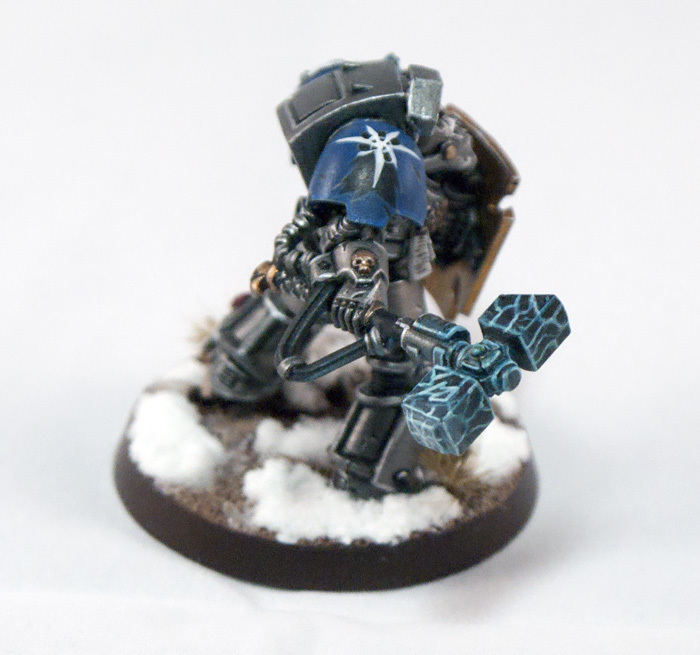 He quickly rose through the ranks and particularly excelled as an assault marine. He is level headed yet brutal at the same time. Their were numerous accounts of him seeking out glory by slaying enemy champions but he would never do this at the expense of the rest of his brothers. 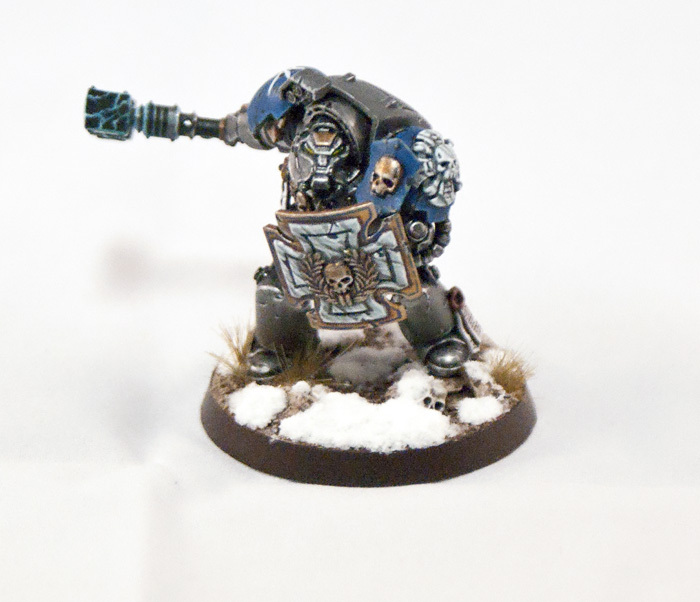 If the mission required him to hold an objective devoid of worthy opponents he would do so without a single complaint. He has been known to risk his own life to save his battle-brothers and thinks of the whole picture instead of just his own glory. He was quickly promoted to the ranks of the 1st where he was awarded a suit of Terminator armor and placed within an assault squad. After experimenting with lightning claws, Marduk discovered he had an affinity with the Thunder Hammer, a weapon as brutal and blunt as he. When Huron began to reorganize the chapter Marduk thought nothing of it, he is a solider, a weapon to be wielded against the enemy, who ever they may be. He knew of Numas when they both served in the 1st but thought little of him, he was simply another Battle-Brother, someone he would sacrifice his life for and expect the same in return. As the Badab War broke out Marduk found great joy in testing his skills against fellow astartes in true combat. 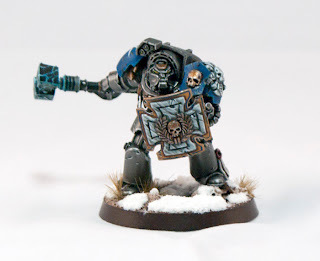 His kill ratio was exceedingly high and he particularly liked to battle the marines of the Minotaurs and Carcharodons, warriors he thought were worthy of his skill. The mortal allies of the Legion were considered expandable by him, just as they were to most of the chapter. If his superiors told him to use the Legion as cover and a meat grinder that is what he did. During the final battle at the Palace of Thorns he was embroiled with the enemy near the gates and hallways of the palace proper and only heard of the fall of Huron through the distorted and confusing comm feeds. As the order to fall back was given he made it to safety with little trouble as many of the remaining brothers of the 1st did. Post-Badab War: As far as Imperial investigators are able to determine Marduk still serves within the Red Corsairs as a member of the Terminator cadre. He has proven himself just as brutal, twisted and malicious as his fellow traitors, a personality change no doubt brought on by the warping influence of Chaos and the Maelstrom. Thanks for looking, until next time. 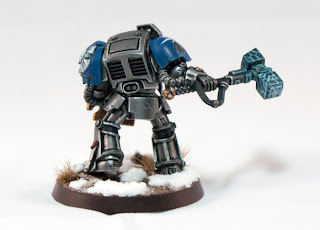 I don't know how much of your techniques you're willing to divulge but how do you paint your marble bits, I think they look fantastic and would love to try and duplicate them on some of my Executioners minis. Thanks! I have no problem with sharing my techniques. It a basecoat of Astronomicon Grey then wash the crevices with badab black, do this as many times as it takes to make them dark enough. Go back and tidy up the grey so its a nice even coat except for the cracks. Then I use Badab Black to paint on the dark veins in the marble. Pick one direction for them to go in but make it looks a little random and varied. I do this is several steps since I want some of the veins to be darker or wider then others. Then mix in some white with the grey and "highlight" the veins, you can also paint in some light veins at this time. Do several stages of this to vary it up, also highlight the edges of the surface at the same time. I then line highlight the edges of the surface with pure white to make it stand out a bit from the pattern. Hope that helps. Maybe I'll make a tutorial on the next Terminator I paint. Terrific looking Terminator you've got there! I have really enjoyed going through your blog and discovering all of the gorgeous models that have passed through your talented hands! I have one small question though: did you get accepted by the 'Eavy Metal team in the end or not? Or are you still waiting? Thanks, and sadly I did not get the job. A real shame that. Ah well, maybe next time? Time will tell. He looks great. Glad I stumbled across your blog. Won't have to keep checking in on the B&C now.